I received my B.S. in physics in 2003 from Franklin and Marshall College and worked for a time as a research assistant at the paleomagnetic laboratory at the Lamont-Doherty Earth Observatory in Palisades, NY. 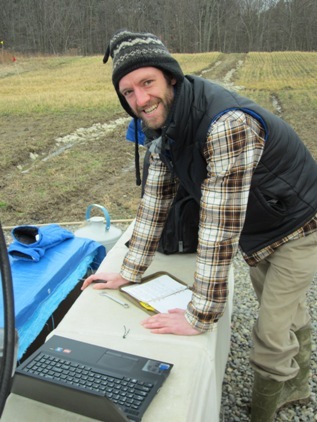 In 2007 I began learning about agriculture and food systems by working on farms in Vermont, and in 2011, I joined the Soil and Water Lab in the Department of Biological and Environmental Engineering where I am currently working towards a M.S. degree. Broadly, I am interested in the interactions of human and environmental systems, with the goal of improving understanding for sustainable management of natural resources. My research focuses on soil, water and atmospheric processes, specifically pesticide transport in groundwater, and greenhouse gas emissions from biofuel cropping systems.